The Mokanger Homestead complex, comprising the remaining second homestead (with many later additions) and the stables, is located on the north side of Mokanger Road about 8.0kms east of the township of Cavendish and opposite the continuing South Mokanger property where the woolshed complex is located. Edward Barnett had taken up the Mokanger run between 1839 and 1841. Thomas and Andrew Chirnside obtained the squatting licence in 1846 and held it until 1876. The core of the present homestead may date from the mid-1860s based on its scale, form and detailing. The substantial bluestone stables, which were once located behind the original cottage and detached kitchen date from the 1840s. The Chirnside family was largely based at Werribee Park, but Wyndam visited Mokanger and used it to raise thoroughbreds as well as to grow wool. Their famous stallion, 'Sir Peter' was at stud at Mokanger in the 1840s. Mokanger, Mount William and Mount William Plains were known as their Wannon runs. In 1885, Alexander McEdward, an absentee landlord, purchased Mokanger. When his widow Alexandrina died in 1900, the AML&F Company took over the freehold land. In 1910, John William and Alice Gardiner purchased Mokanger. The original house was extended at that time with a new weatherboard wing built across the front, and again in 1929. The homestead block was sold in 1976. The two buildings retain a high degree of integrity and are in excellent condition. The Mokanger Homestead complex is of historical and architectural significance to the Southern Grampians Shire. 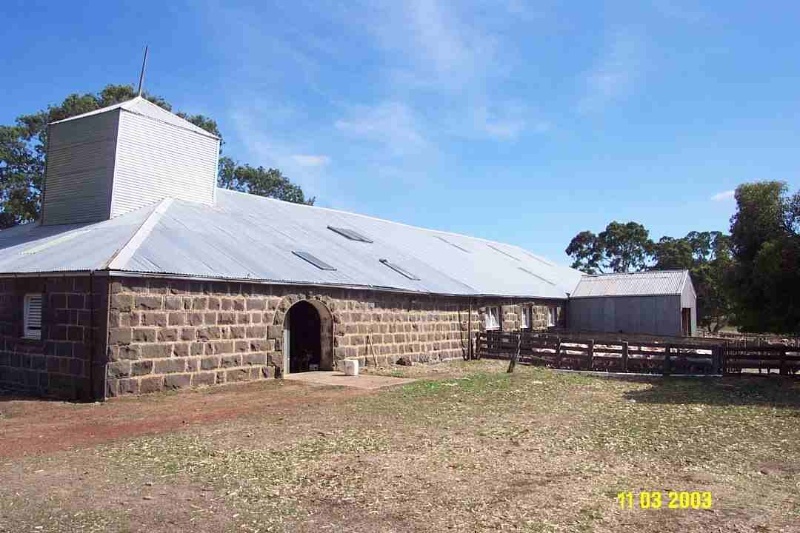 The Mokanger Homestead complex is of historical significance for its direct associations with Thomas and Andrew Chirnside, two of the most important pastoralists in Victoria. In particular, the bluestone stables dating from the 1840s demonstrate their commitment and interest in thoroughbred racing. The homestead complex is of architectural significance because it retains early building fabric within the present house as well as several later layers, each reflecting the values, interests and capacities of the Chirnsides and of the later owners, the Gardiner family, owners for seventy-five years. The two buildings are in excellent condition. The homestead appears to survive in two main sections, the earlier section being brick and the later timber. Both are single-storey and both have shallow pitched corrugated iron roofs. The painted brick section, which presumably was symmetrical about a central hall, has French doors opening onto a simple timber side verandah. This may have continued across the original facade. Its chimneys may have been rebuilt. The 1910 weatherboard addition is symmetrical about the front door. It has small polygonal bay windows under conventional projecting gables. The gables are half timbered with roughcast infill. The timber verandah is on three sides and repeats the outline of the bay windows in plan. The valance comprises simple segmental arches with vertical square-sectioned timber. The stables are symmetrical and rectangular in plan with a simple hipped roof and a skillion extension at the rear. The bluestone masonry, although coursed, is relatively crude. The roof is now clad with corrugated iron although internally, the original shingles are clearly visible. The joinery of the stables is vernacular but fine, including hand-forge hinges, latches, etc. One internal ledge and brace door is particularly notable. Continuing as a mixed pastoral property. The house is much altered, especially internally but the stables survive with a very high degree of integrity.